« Zubbles are on their way! It’s dangerous, you know, having expectations on hold for so long. Ever since I read about Zubbles in 2005 in the Popular Science article, I’ve been anticipating their availability. So did I brace myself for disappointment? Nope – it never occurred to me. Did I experience a cruel let-down? NO! They’re great! I’m afraid I have to admit that a giggle may have slipped out – at the very least grinning was involved. I didn’t want to take a chance on the non-staining feature, so I took the Zubbles outside. Yes, I’m a skeptic at heart. There was a slight breeze on Monday during my first test flight. But, since it was very light and intermittant, the bubbles did what bubbles do. The first thing I noticed was that the blue ones faded a little bit in mid-air in contrast to the pink ones which seem to hold their color better. But it is only a minor disappointment. It’s amazing how much color you see considering how thin the walls of bubbles are and that the sun was very bright. Another thing I noticed was that there was a little drop of concentrated color at the bottom of most of the bubbles. This reminded me of the original Popular Science article which talked about early experiments with food coloring and how all the color would accumulate at the bottom of the bubble. However, in the case of Zubbles, it seems to me that this is just an extra droplet of solution hanging there. It makes me want to do some food-color bubbles for comparison. 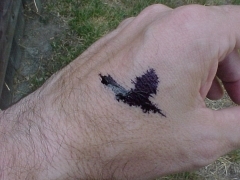 To test for staining, the first thing I did was apply a little solution to the skin of the back of my hand. It was a deep, dense blue like you might see from food coloring – maybe even the gel type. Then I rubbed it with my finger. Hey! Where’d it go? Just as advertised – it disappeared. It left behind a soapy-feeling film that dried pretty quickly. Oops! 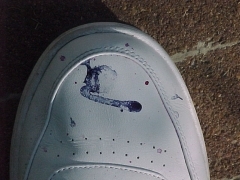 Then I looked down at my nearly new white leather tennis shoes. There were a couple of big blue spots. “OK,” I told myself, “don’t panic.” I decided to wait to see if they disappeared on their own. Perhaps ten minutes later I looked again. Although slightly faded, they were still there. Oh, no! Then I remembered that they were said to clean up easily. So I got a damp paper towel and dabbed. Oh, no! The color returned to its fresh-from-the-bottle brightness! …and then it was gone. Cleaned up as easily as they said! The timing of shipment was perfect for me (all things considered), since my niece’s and nephew’s birthdays are in a few days. I’m looking forward to their reactions when they play with their very own Zubbles. This entry was posted on Wednesday, July 15th, 2009 at 6:35 pm	and is filed under Fun. You can follow any responses to this entry through the RSS 2.0 feed. You can leave a response, or trackback from your own site. My order was put on backorder so I assume I got bottles from a later batch. The color was great and didn’t stain like promised. As a bubble solution, however, Zubbles leaves something to be desired — it’s really hard to get any bubbles and the bubbles you do get don’t last nearly as long as traditional bubbles. I don’t know if other batches have this problem. All in all, these bubbles are pretty cool.